1 Sprinkle the chicken with some vinegar and set aside. 2 Rinse sage leaves, pat dry and finely chop. 3 In a bowl, mix lemon juice, honey, sage and olive oil. Season with salt and pepper. Marinate chicken with the sage mixture about 1 hour, covered in the refrigerator. Peel and cut onion into chunks. Peel garlic. 4 Place chicken, onion pieces and garlic cloves in a roasting pan and pour in a little chicken stock. 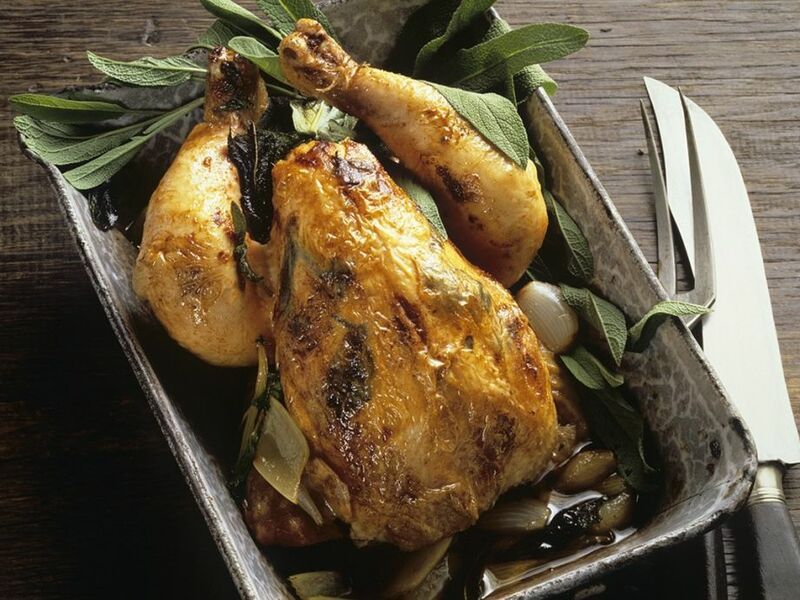 Bake for about 1 hour at 175°C (approximately 325°F), until chicken is cooked through, basting occasionally with chicken stock and red wine.